Nikhil Siddharth , who became an actor with 'Happy Days', became a solo hero, and created a special place with different films. 'Kartikeya', 'Swamy Rara', 'Where do you go to Chuvadavada' movies with the Telugu audience. Even though the audience came forward with a youthful film like 'Kirkak Party' last year, the film did not seem too impressive. This time, Nikhil has come up with another thriller story. That's the film 'seal'. Now filming is done and ready for release. At this point, the film was caught up in a controversy. Jagapathi Babu is the hero of the same name. The film was released on January 26th. But for the movie ticket bookings, bookmyshou and pt.Mame apps like Nikhil 'Seal' movie poster and details are used. Nikhil came to the attention of the matter and he reacted strongly. The film is not going to be released this week and some have tweeted that they are selling their own logo design and using their name. The details of this will be revealed soon. Talking to a news channel, Jagapathi Babu has been accused of producing 'mudra'. Nikhil tweet, Jagapathi Babu's 'Seal' film producer Natti Kumar responded to the comments . Naidu faced a media conference on Saturday. By Monday, Nikhil had to apologize to him and demanded compensation for lost 'mudra' distributors. Otherwise, he warned that he would take legal action. The Nikhil team had allegedly beaten the copy of their 'mudra' title. Evidence has shown that the Film Chamber clears the 'Seal' title and the Censor Board has issued a certificate. Nikhil has been stunned so far without stopping this. 'Is there a hero's tradition in the film industry to watch a movie? Was the film producer losing? If you are really responsible then you must tell me your producer that my poster has fallen. The producer will speak with the chamber immediately. We will take care of ourselves. It's a matter of internalization. Your producer does not know, we do not know, the chamber does not know. Suddenly, one channel did not go. Do not watch this movie on social media, will you post this movie not mine? Do you think you're a hero? ' Natti Kumar was angry. 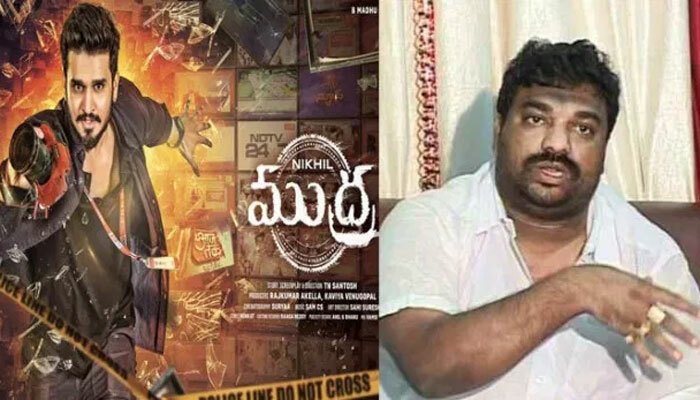 Nattikkumar alleged that many producers were destroyed by Nikhil. 'How many producers have been destroyed by you. Extermination. Today you can lose your producer because of this movie .. This disagreement is damaging to us. Destroy Your Producer .. Destroy us. Words of a hero go to people. And the words that you said went to the audience. We went and destroyed our film. This is the cinematography of the film. If you are suffering and you are trying to stop that film, you are trying to stop him. Is that you? Drunk myakam ..? What did you do with the mice?